Frida Kahlo was one of the most famous Mexican painters of the 20th Century and among the first women ever to have a single exposition. Her life and her paintings were signed by illness, bedriddenness and constant pain, due to a polio infection at age 6 and a nearly deadly accident when she was 18. An iron handrail impaled her through her pelvis, fracturing the bone. She also fractured several ribs, her legs, and her collarbone. She spent a month in the hospital and two months recovering at home, before being able to return to work to cover her medical expenses. As she continued to experience fatigue and back pain in 1926, her doctors ordered x-rays, which revealed that the accident had also displaced three vertebrae. Her treatment included wearing a plaster corset, which confined her to bed rest for several months. The year before she died, her right leg was amputated, due to gangrene, a late consequence of the early polio contraction. Nearly all of her paintings show herself and her struggle with her physical situation. Nevertheless, she had an extraordinary career as a painter and was, together with her husband Diego Riveira, deeply engaged in politics, being a member of the Mexican Communist Party. She died on July 6, 1954, around 6 a.m. at the age of 48, officially from the pulmonary embolism, although no autopsy was performed. Suicide by morphine was the inofficial version. 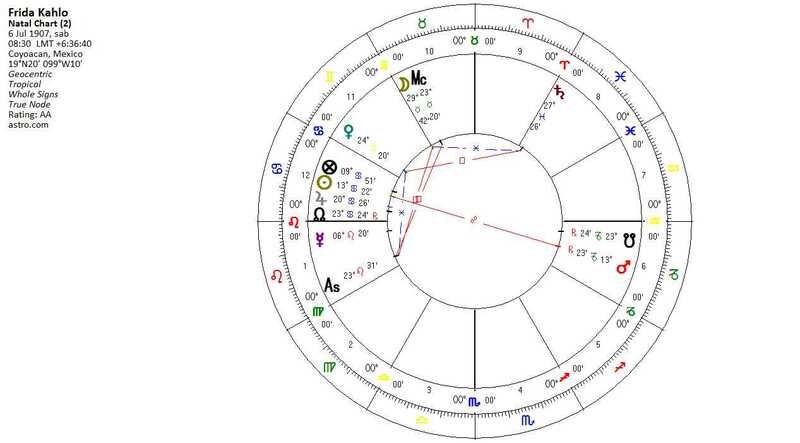 In the following analysis, I will look at the astrological signatures of September 17th, 1925 the day of the fatal accident when Frida Kahlo nearly lost her life, but which also happened to be the turning point in her artistic career. Confined for many months to bed and fighting against her pain and disability to move, she discovered a unique style which made her famous. In this article, I will only focus on annual profection and zodiacal releasing as a personal research. She was born during the day, and thus Mars is the most malefic planet in this chart. The planet is opposite Frida’s Sun. The AC ruler Sun describes her life purpose, the overall goal to achieve, her life project. The luminary is in the 12th house, associated with hospitals, sufferings, hidden enemies and isolation. These issues are thus linked in some way to her life purpose. The Sun is bonified by Jupiter. He rules the 8th house of death, but since Jupiter receives the Sun (life light) by exaltation, he grants Frida life. While Jupiter is the benefic in sect, this bonification is not an easy one She does not die, but she is confined to bed for a long time, and to frequent hospitalizations (both planets in the 12th) and surgery (Mars in opposition). Pain will never leave her. 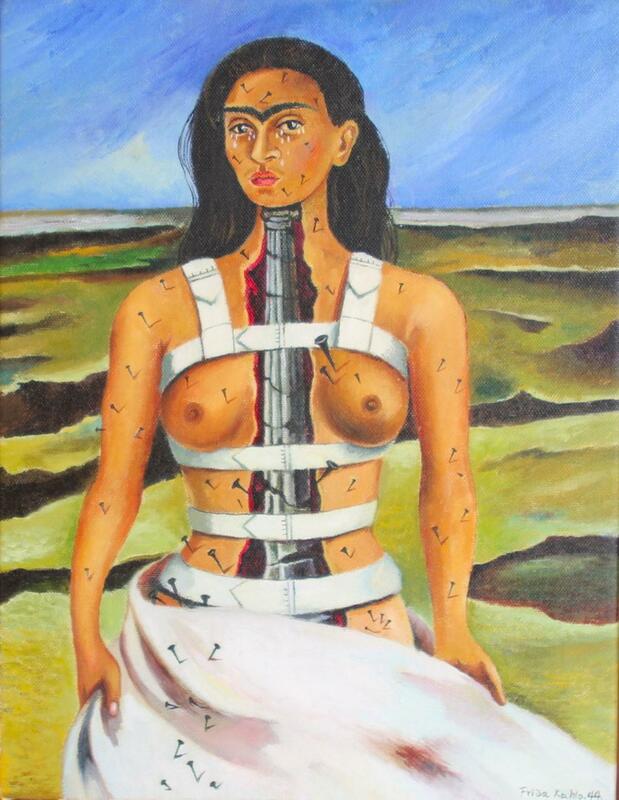 When the AC ruler is in the 12th house, as in Frida’s chart, self-destruction, depression or suicide is likely to show up. We know for sure that Frida suffered from deep depression, due to her constant pain and the frequent infidelities of her husband Diego Riveira. From an astrological standpoint, it is quite possible that she indeed committed suicide (see Lilly p. 460). Saturn rules her 6th house of illness, describing her sickness as chronic or long-lasting. Saturn is received by the 8th house ruler Jupiter, who aspects him by trine: this makes her illness hard, incurable but not mortal. Mars in the 6th house describes illness coming through accidents or from fevers/infections/inflammations. The Moon, ruler of the 12th house is in the 10th house: her career is associated with isolation and sufferings (12th house) and her illness (Moon sextile Saturn ruler of the 6th). Also, the ruler of the 10th house squares Saturn (illness), which represents her lifelong handicap. Frida is 18 years old on the day of the accident. She is thus in 7th house profection year (profecting from her 1st house, which describes her physical well being and life purpose). 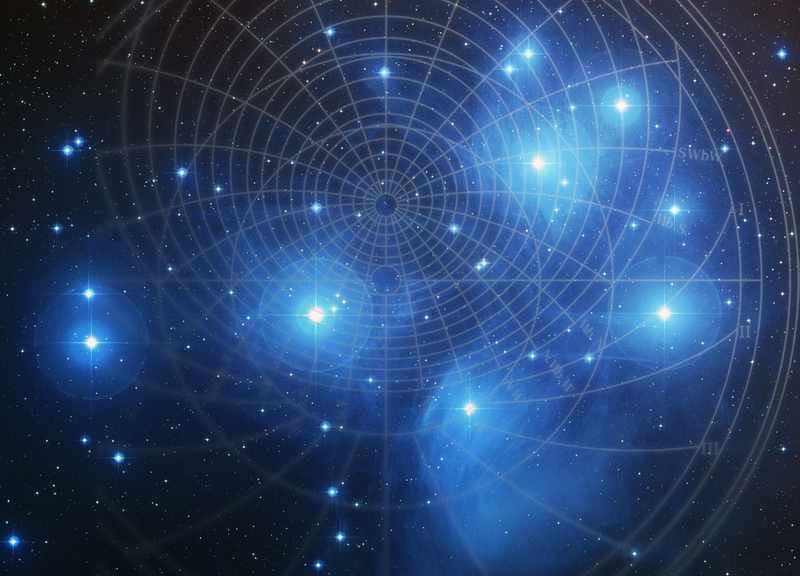 Aquarius is activated and its ruler Saturn, becomes the lord of the year. While he is not the malefic out of sect, he is still a malefic and in the 8th house, making life-endangering situations likely. Saturn sextiles the Moon (ruler of the 12th house, hospitals) and is configured by trine with Sun/Jupiter (both in the 12th house) and by sextile with Mars (accidents), so we can assume, that these planets will get into or cause trouble. As a side note, I would like to remember, this was not the first time, Saturn was activated in Frida’s chart. The planet has a 12-year cycle in order to make a round in the zodiac, and exactly 12 years earlier, in 1913, Frida had contracted polio, a period, during which she was bedridden for 9 months. As we will see below, the day of the accident, Saturn was transiting Frida’s angular 4th house, her very foundations were shaken. If we profect from the 6th house, in order to focus specifically on sickness, we find that her 12th house is activated and thus the Moon. 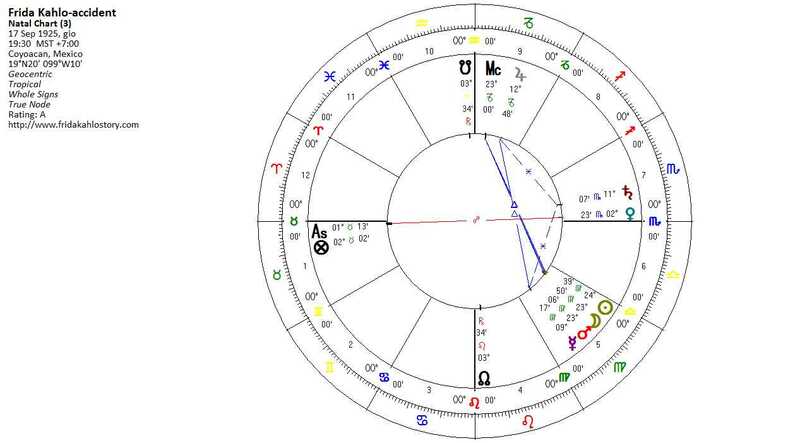 This connects her illness with hospitals, isolation (12th house in Cancer) and career (Moon in the 10th house). As Mars is the most malefic planet in this chart, it is possible to profect from him, in order to get more details. Since he is in the 6th house of her birth chart, he gives us thus the same result as the profection from the 6th house: In 1925, the profected Mars activates the 12th house, where her life light (Sun is. Let’s now see the Zodiacal releasing, first from Fortune, which describes the events of fate, life’s circumstances, things which just happen and her physical condition. Since the accident was a major event of her life, it is supposed to show up. I will then direct from Spirit, which is related to Frida’s choices, her career, vocation and life direction. Since she painted much of her art from her bed, often depicting herself and her physical struggle, we can suppose to see career issues as well. Starting from Fortune we see, that Frida is in a major Cancer period, which will end in 1932. This means, that the first 25 years of her life are happening in a major peak period. In these years, she is defining her hold life and career through the events happening to her on a physical level. Since Cancer rules the 12th house, these years are associated with sufferings, isolation and hospitals, but, and this is so extraordinary in her chart, with her career. During that major level 1 period, at the end of 1924, she enters a Level 2 Capricorn period, which highlights her 6th house of illness. Capricorn is also the sign, the malefic out of sect is in, who is thus co- activated. This is a mean peak period for her, since Capricorn is the 7th house from Fortune. Cardinal signs are the most sensible points in Frida’s chart, as these are not only angular from Fortune, but also host both the main benefic (Jupiter) and the worst malefic (Mars). From this, we can assume, that terrible and good things will happen in a short sequence of time or depend one from the other. We also have to keep in mind, that Capricorn is already activated by annual profection. This makes this year to be a very difficult one: Mars and Saturn are activated contemporaneously. In Capricorn we find Mars, natural ruler of accidents in his exaltation, he is opposed to the Sun (life). Saturn rules the 6th house of illness and is received in the 8th house of death. The illness will be life-endangering but not fatal and last a lifetime. Shortly before the accident, Cancer is also activated on level 3, the 1st from Fortune (physical health). On the day of her accident begins a Taurus level 4 period. Taurus rules the 10th house in Frida’s chart and thus her career. On the day of the accident, Venus and Saturn are angular in Frida’s 4th house, while the Moon joins her Sun. Starting from Daimon (Spirit), Frida is in a Level 1 Scorpio period. Scorpio rules Frida’s 4th house of foundations. Scorpio is ruled by Mars (accidents), in the 6th house (illness). To some extent, the very base of her work was her illness. But Mars also rules Aries, the 10th from Fortune, linking this period to Frida’s career. On level two, Gemini (11th house, friends, political groups ecc.) is activated and thus Mercury, in the 1st house (health). On Level 3 Virgo and thus once again Mercury are activated (ruler 2nd and 11th in her natal 1st house). I wonder if that might describe a process of self-defining through friendships and (political) group memberships. 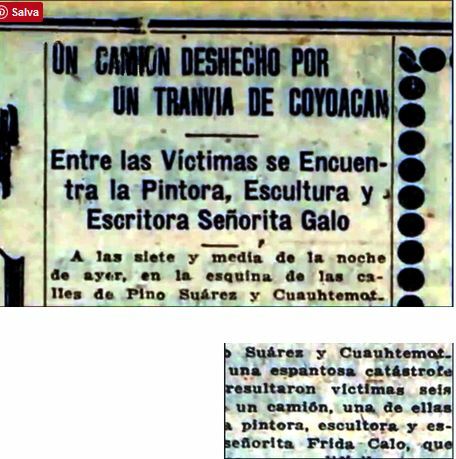 Shortly before her accident, she had been involved with the Communistic Zapata movement. This is interesting, as political parties are described by the 11th house, while its focus on the correct distribution of goods can be associated with the 2nd house. On September 17th, the Moon is activated on level 4, and thus Frida’s career (12th house ruler Mon in the10th). On the day of the accident, all these three level rulers Mars, Mercury and the Moon are conjunct in the Gates of Hades of Frida’s natal chart. Let’s now have a look at the chart of the accident. We find Saturn and Venus angular in the 7th house, so we can suspect the major injuries to come from these two planets, especially Saturn as he is the malefic out of sect in this event chart. Her spine was broken in at least three points, which was the main reason for her years-long bedriddenness, followed by long time on the wheelchair. It is reported that she had lifelong problems while walking. An iron handrail impaled her through her pelvis (and supposingly uterus), which was the reason she could not have children. Frida Kahlo’s life was incredibly full of physical tragedies, which appear to have created a kind of dead-end road for her with the only choice either succeed or surrender. The reason why I choose Frida for an in-depth analysis is her incredible refuse to be a victim and her struggle to handle her lifelong pain and multiple handicaps in order to succeed. And she did. 60 years after her death, she is still one of the most famous female painters in the world and Mexico’s icon. Other sources relate her problems to a spina bifida. The AC in Leo is associated with putting one’s personality somewhat on a stage, theatrality ecc. In her chart, the Sun is hidden in the 12th house (isolation) and in Cancer, somewhat protecting itself. But the dispositor of the Sun, which is the Moon, is elevated in the 10th house, so she cannot stay hidden. Her isolation becomes public.While Frida personally stays hidden for most of her time, the immage of her does not. Surgeries are also described by Mars, as they requiere sharp and metallic instruments. When the accident happend, she had already spent many months in a hospital as a 6- years old due to a Polio contraction. There is some confusion about which planet is more important, the ruler of the house or the planet within the activated house, but I suppose they are both. The Gates of Hades is the old name of the 2nd house. Entering Level 2 Capricorn period is very threatening. We should take care before entering this level.